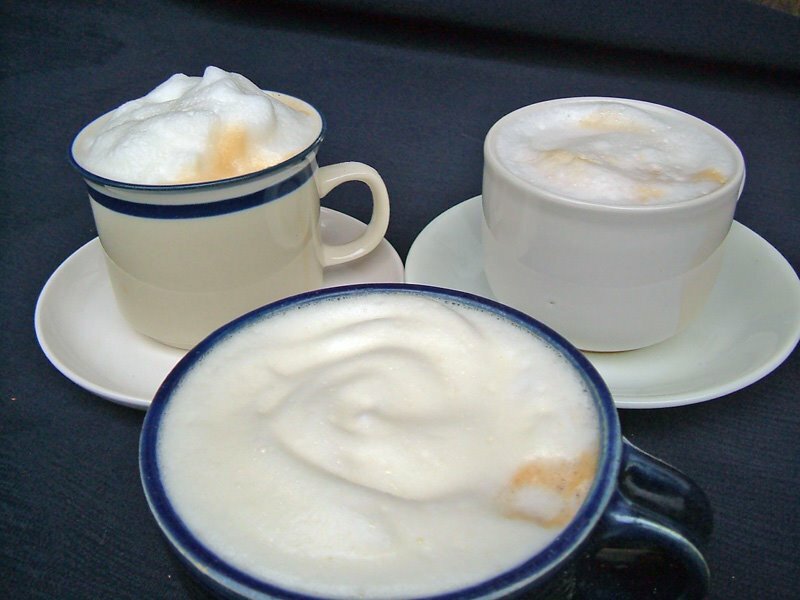 VEGAN CAPPUCCINO-- WHICH NON-DAIRY MILK FOAMS THE BEST? UPDATE: Ap. 28th, 8:50 am....cappuccino with Vitasoy Original. PS: FOR NOTES ABOUT HOW TO KEEP SOYMILK FROM CURDLING IN COFFEE, LOW-ACID COFFEE, CHOOSING COFFEE, STOVETOP ESPRESSO MAKERS, ETC., SEE THE BLOGGER COMMENTS FOR THIS ENTRY. out of the cupboard and made myself a beautifully-foamed cappuccino using my homemade soymilk. My husband (an expert) was very impressed! 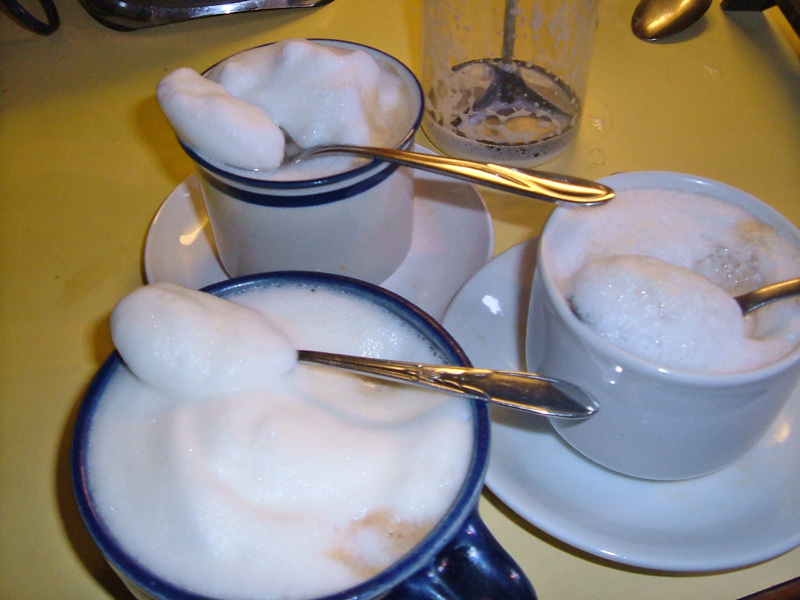 The foam really lasted, too. The homemade soymilk won hands-down again! A beautiful stiff, long-lasting foam with only 30 seconds in the hand-plunger! The Soy Dream came in second, and the Almond Breeze third-- though it had a much better foam than the Silk used in the coffeehouse. 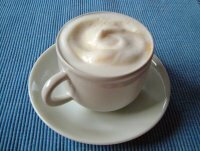 UPDATE, morning of April 28th: I tried a cappuccino with Vitasoy Original this morning (see photo above) and it was very nice-- similar to soy Dream, so I'd say they tie for second place. 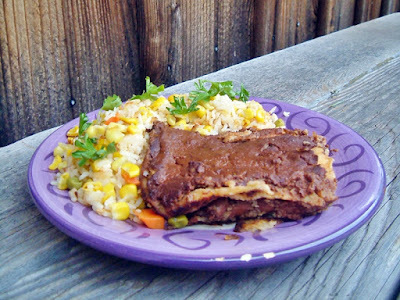 HEAR MY INTERVIEW ON GO VEGAN TEXAS! RADIO, ALONG WITH KAREN DAVIS OF UNITED POULTRY CONCERNS-- go to this link to access the archived interview. This is just a guide--you don't need a recipe for this. Clean and trim and slice a whole pile of kale-- it will cook down alot. Steam, boil or microwave some thin-skinned potatoes, cut into chunks. I microwave them in a microwave steamer. In a large deep skillet, saute as much chopped garlic as you want in a little olive oil-- gently-- don't brown it! I would use maybe 4 cloves for the two of us. Add some sliced mushrooms-- as much as you want-- and brown them a bit. Add the kale and about a cup of vegetarian broth. Bring to a boil and then turn it down to medium and cover it. While this cooks (check it to see if you need more broth-- you want it to cook down, but still be a bit brothy to moisten the potatoes), brown as many Tofurkey Italian Sausages as you like, in a grill or in a skillet with a little olive and/or Asian (toasted) sesame oil. 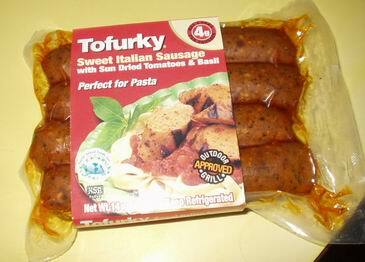 These vegan sausages are really good, but they are big and kind of high in fat. A big eater or a very hungry person can eat a whole one; daintier or less hungry diners may only want half of one. 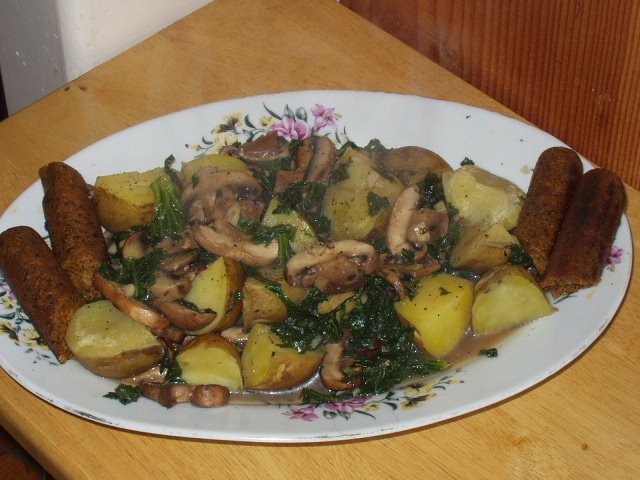 When the kale is tender (I cook it maybe 10 minutes) and the potatoes are done, drain the potatoes and add them to the kale, stirring gently to mix the ingredients. Add a bit more broth if necessary. Add salt and pepper to taste (you could add a bit of red pepper flakes, if you like things spicy) and serve with the browned veggie sausages. My mom came over for lunch today and I was looking for a light entree to make. 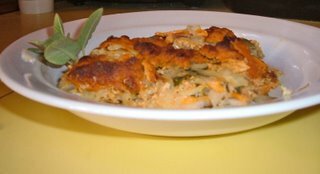 I had 1/2 a raw sweet potato left, and 1/2 a block of my homemade vegan "cheddar" in the freezer, so I decided to mix the sweet potato with white potato and make a vegan gratin. It was delicious! 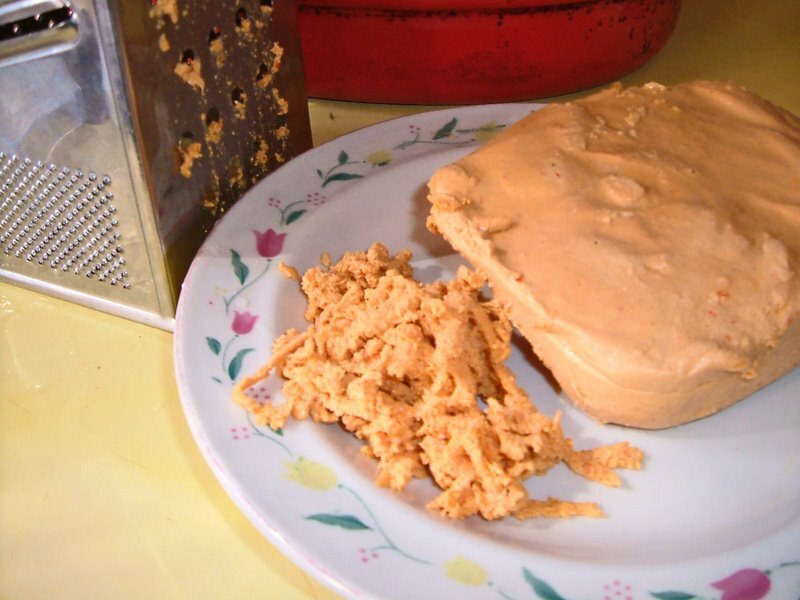 My "cheddar" is tahini -based and has alot of flavor-- it also melts well. 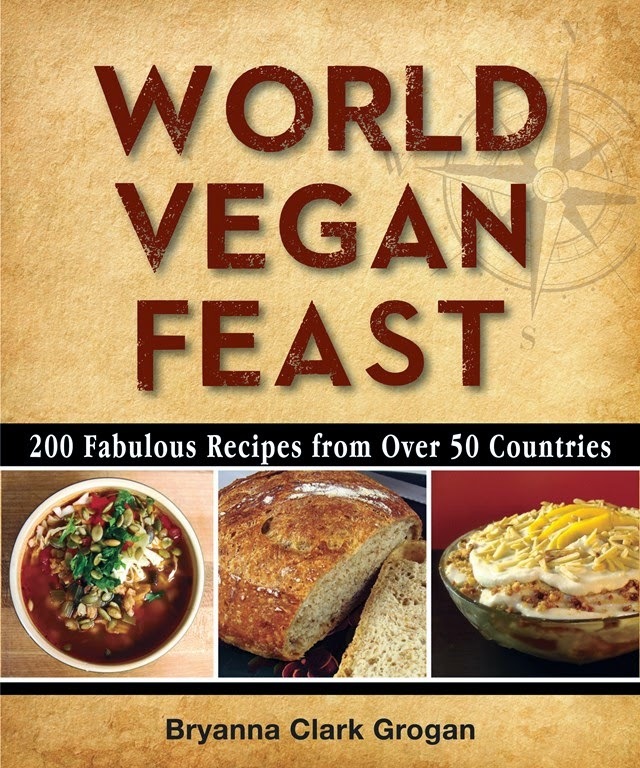 (a related recipe for Vegan "Gruyere" is in my new book .) However, you can use any other favorite vegan cheese instead. Preheat the oven to 350°F. Lightly oil a 2 qt. 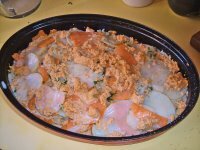 gratin dish or shallow casserole . Put on a pot of water to boil. I use a mandoline slicer to cut the potatoes very thinly. I have one similar to this one , but there are so many and some for every budget . You can also do this on an attachment of your food processor. When the water boils, add some salt and add the potatoes and sweet potatoes. Stir the potatoes so that they don't clump together. When the water boils again, time for 1 minute. Drain the potatoes and mix in a large bowl with the cooked onions and sage, and the parsley and garlic. Mix well. Spread 1/3 of the potatoes in the prepared pan. Sprinkle with salt and pepper and 1/3 of the "cheese". Repeat layering two more times. Pour the warm soy or nut milk over the gratin. Cover with foil. Bake 25 minutes. Remove foil and bake 25 minutes more. Let the gratin stand for 5 minutes before serving. 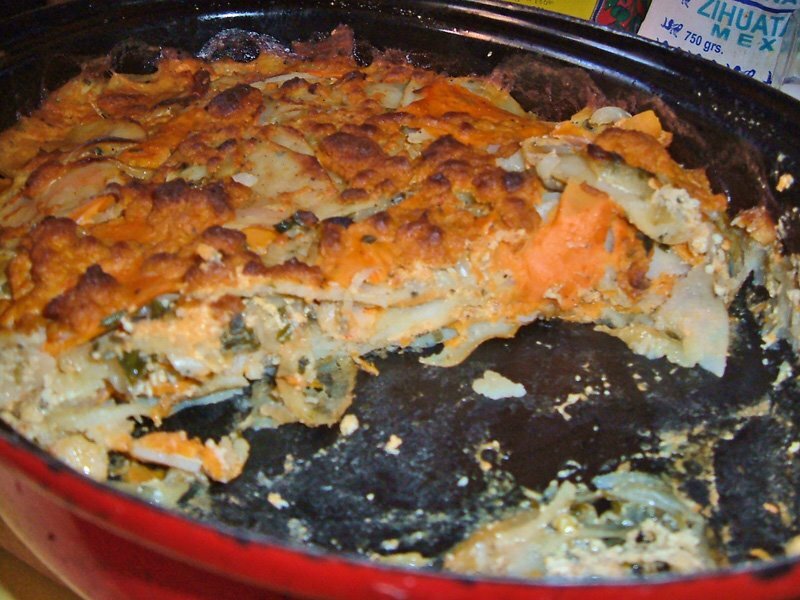 Nutrition (per 1/4 of the casserole): 209.2 calories; 20% calories from fat; 4.9g total fat; 0.0mg cholesterol; 137.0mg sodium; 857.5mg potassium; 36.8g carbohydrates; 6.0g fiber; 6.7g sugar; 30.8g net carbs; 6.1g protein; 3.8 points. My grandfather, Gilbert Tonge (on the left), with his colleagues in San Francisco in 1916. 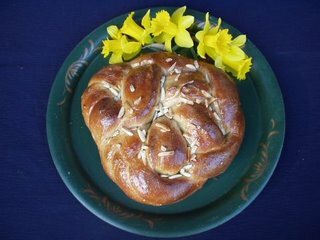 SCROLL DOWN FOR A LIST OF LINKS TO SOURDOUGH RECIPES ON THIS BLOG. Today is the centennial of the Great 1906 San Francisco Earthquake. 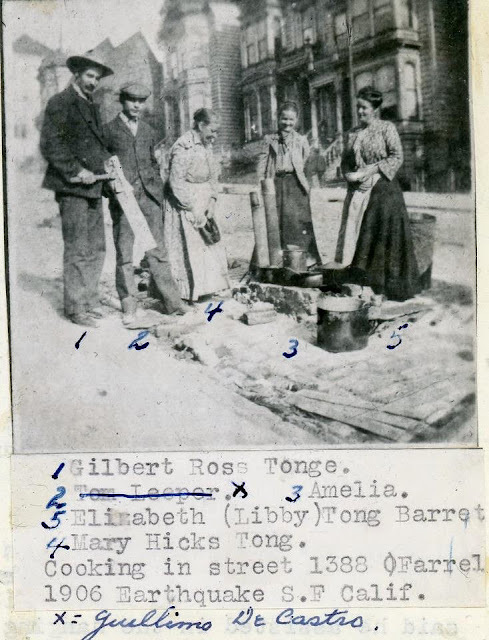 That's where I'm from, originally, and my maternal grandfather, Gilbert Tonge, survived the disaster (he was a 22-year-old art student at the time). He used to tell us about it and I wish I had recorded some of that! 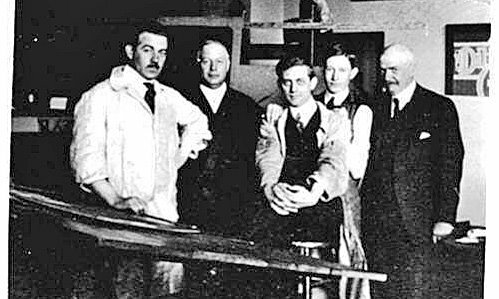 But, of course, we were young, and didn't realize the historical importance of his stories. He was born in California, in what is now Placerville, in El Dorado County. The town was called "Hangtown" at one time! This is a photo of my grandfather, Gilbert Ross Tonge (age 22 at the time, on the far left-- my cousin Chris Tonge looks just like him! ); Guillermo DeCastro next to him; then my great-grandmother, Mary Hicks Tonge; then someone named Amelia; and, on the far right, my grandfather's Aunt Libby (Elizabeth Tonge Barret). My mother was also born in California. Not to be outdone by her father, my mother was visiting California in 1989 when the Loma Prieta earthquake hit. In fact, she was in Santa Cruz, near the epicenter, and she and a friend [both senior citizens] had to run from a store, with goods from the shelves falling on their heads! Anyway, all this got me thinking about San Francisco food memories. What came to mind first and foremost was sourdough. The sourdough bread was so delicious! I hope it still is-- I haven't visited for some time. You can't always get good sourdough bread up here very easily, so I make it myself. Of course, I really need an outdoor oven to get a good crust on it, and we may try making one this summer! UPDATE: Try the "bake in a pre-heated heavy pot or casserole" method for a super crust in your stove's oven. I make a yogurt-based sourdough starter. It works like a dream, doesn't need to be fed all the time, and can lie dormant in the refrigerator or freezer for months, if necessary, and be revived. I have since revised the starter to use a soy yogurt starter. To acknowledge the centennial, I'm posting the vegan yogurt-based starter recipe. More Ways to use Sourdough Pancake batter-- sourdough, vegan , whole grain wafffles and crepes! I keep sourdough starters in my fridge at all times. They will stay “fresh” (that is, active enough to use straight from the fridge in a bread recipe) for about two weeks. If you haven’t used your starter and refreshed it within two weeks, then dump out some of it and refresh it (preferably once a week). I keep a white starter, and one whole wheat and one rye. In my opinion, most bread machine breads just don’t come up to scratch compared to our oven-baked breads. There is something missing. I have discovered that if you use the old-fashioned sponge method (the liquid and half the flour with the yeast—often much less than usual-- risen for 2 to 12 hours), or an Italian biga starter, or French poolish, etc., OR the use of sourdough gives better flavor, texture and keeping qualities (and you can also get away with a more moist dough, which I think makes better bread). If I use sourdough straight from the fridge with hot liquid and a little yeast (only 1.2-1 tsp. ), I can make a bread without starting it hours before (although that is no problem—just put on the sponge before going to bed at night). I have converted lots of breads this way. If you use some yeast and sweetener, the sourdough flavor is not pronounced. To convert, use 1 c. starter in place of 2/3 to 3/4 c. liquid and 1/3 c. flour (approximately). I generally use Canadian unbleached flour, which is similar to American unbleached bread flour, and wholewheat flour made from hard wheat (grind my own), and have not found it necessary to use gluten flour (even in all wholewheat bread). I learned how to make San Francisco-style sourdough starter from Sunset magazine years ago. They had scientists from the University of California look at San Francisco starter and found that the closest thing to that particular sourdough bacteria was yogurt. I made it for many years with dairy yogurt and loved it. When I became a vegan, I tried it with soy milk, and it worked just fine. NOTE: I have never tried this with other types of non-dairy milk. NOTE: Make sure that all utensils and containers are freshly washed and then scalded with boiling water, to avoid any foreign bacteria. OR a packet of dairy-free freeze-dried yogurt culture. 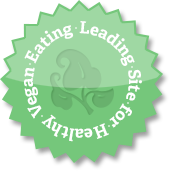 Vegan Yogurt Starter is available here in the USA and Upaya Naturals in Canada. Combine the ingredients in a glass, ceramic, rigid plastic, or stainless steel quart (or L)-size container, like a canning jar. Stir the mixture well, cover and let stand in a warm place for 18-24 hours, or until the consistency of soft yogurt. Stir the mixture until it is smooth, then cover the container tightly and let it stand in a warm place until the starter is full of bubbles, has a bit of clear or grey (not pink-- see caution above) liquid on the top, and smells pleasantly sour (it will get a sharper tang with age). It will take from two to five days to achieve this. EVERY TIME YOU USE THE STARTER, replace the amount you used with equal amounts of warm water/soymilk mixture (1/2 & 1/2), and unbleached flour. For instance, if you use 1 c. of the starter, you should have about 1/3 c. of the starter left in the jar. You add back to the jar 1 c. warm water/soymilk mixture (1/2 & 1/2), and 1 c. of unbleached flour. Stir it up, cover the jar, and set it on the kitchen counter for about 8-12 hours, or until it's bubbly again, then refrigerate it until the next time you use it. TO INCREASE THE STARTER, if you want to make a larger recipe or give it away, you can add up to 10 c. EACH of water/soymilk mixture (1/2 & 1/2) and unbleached flour to 1 c. of starter. Use a LARGE container or bowl-- the starter may QUADRUPLE in size, then fall. It will take about 2 days for this much to get bubbly and form a clear liquid on top. YOU CAN USE OTHER FLOURS FOR STARTERS, but the white one is the most versatile. 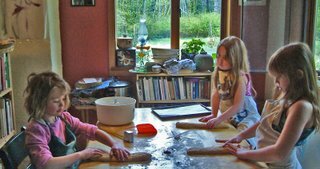 If you make rye bread, or buckwheat pancakes, often, you can make rye, Durham semolina, or buckwheat flour starters, or a wholewheat starter. But you can use the white flour starter in a rye or wholewheat bread, or a buckwheat pancake batter-- it only adds 1 c. or so of white flour and you can use wholegrain for the rest. 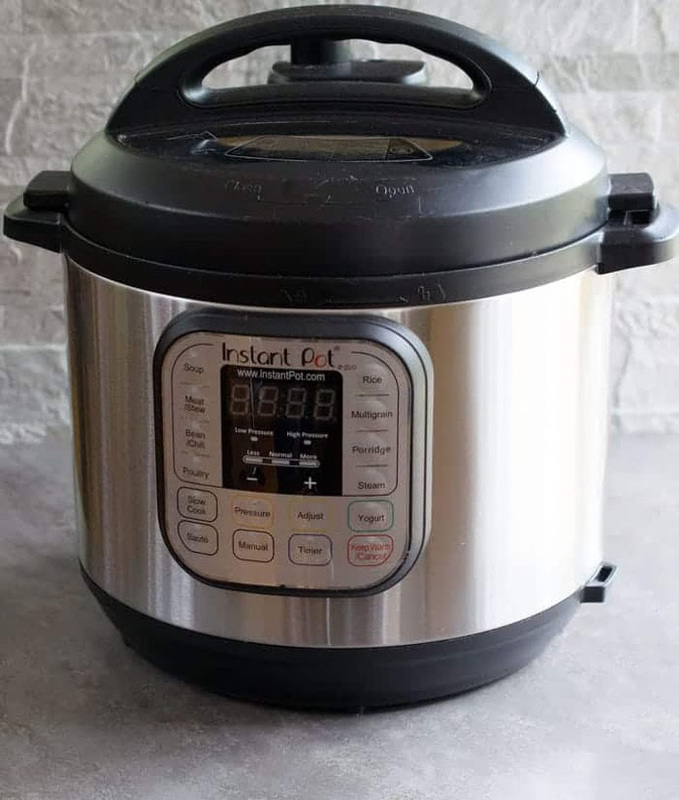 YOU ARE SUPPOSED TO LET THE STARTER COME TO ROOM TEMPERATURE BEFORE USING it in recipes, but I often use it cold and use very warm liquids in the recipe to compensate-- I haven't had any trouble with using it this way. After using the starter for a while, IF IT BECOMES TOO LIQUIDY, add a bit more flour in proportion to the liquid when you add the ingredients back into it. 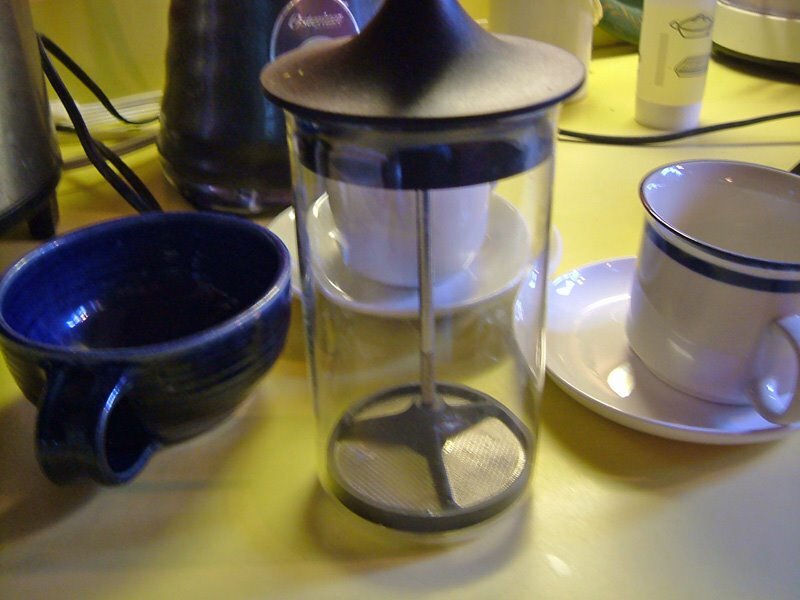 TRY TO FRESHEN THE STARTER AT LEAST ONCE A WEEK IF YOU’RE NOT USING IT. TO "FRESHEN" THE STARTER AFTER NOT USING IT FOR SOME TIME, discard or use most of it, leaving just enough to get it going again (1/4-1/3 c. for a quart jar). Add equal amounts of warm water/soymilk mixture (1/2 & 1/2) and unbleached flour. Stir it up and let it stand on the kitchen counter until it gets bubbly again, as instructed above. If it doesn't bubble after a day or so, it's probably dead, and you'll have to start over again. Watch out for colored liquid-- anything other than clear or grey means it should be discarded. IF YOUR STARTER IS OLD, FRESHEN IT AS ABOVE, BUT YOU MAY HAVE TO REPEAT IT FOR THREE OR MORE DAYS IN A ROW TO GET IT REALLY BUBBLY AGAIN. Do a small amount first, then gradually increase the amount. If it still seems sluggish after two days of freshening, you can add a tablespoon of sugar and/or 2 T. mashed potato flakes (just this once—you don’t need to keep adding them later on). FROZEN STARTER must stand at room temperature for 24 hours before using. Yesterday I made my Cinnamon Roll Lamb for the kids. Here are the pictures of it unrisen, risen, and baked and glazed. It's always a big hit. SEE THE RECIPE BELOW. This is an Easter tradition in our home and the kids love it! 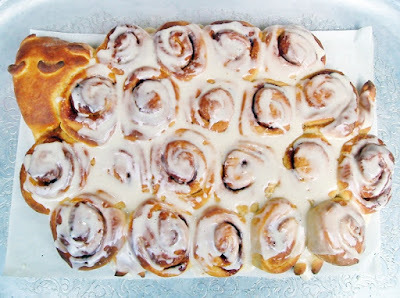 NOTE: You can use any favorite cinnamon roll dough (the amount you need for this recipe would contain about 2 1/2 cups flour) to make this. See my low-fat dough recipe below. Use half of the risen dough. Pinch off about 1/4 of the dough and set it aside, covered, for the head, legs and tail of the lamb. 1/4 c. sugar mixed with 1 1/2 tsp. cinnamon. 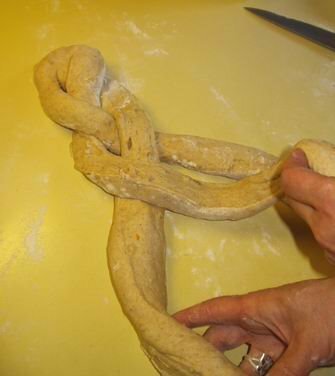 Starting at one long edge, roll it up like a jelly roll. Seal the edge well. With a sharp knife, cut the roll into 20 slices, each about 3/4” thick. On a non-stick or lightly-oiled baking sheet, arrange the slices side by side in 4 rows-- 4 slices in the top row; 5 slices in the second; 6 in the third; and 5 in the bottom row. This forms the body of the lamb. 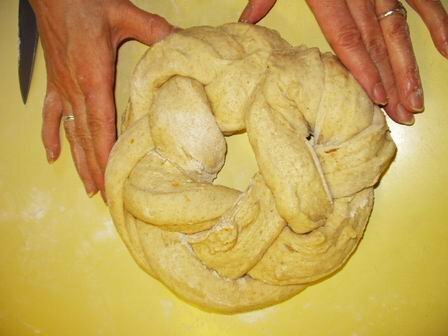 Use the reserved dough to make a round bun for the head, with a triangular-shaped nose, bits of dough rolled into little "snakes" for closed "eyes", two pointed ears, two hoofed feet, and a tail . Attach them, tucking under the “body”. Cover and let rise until doubled. Bake at 325 degrees F for 25 minutes, or until golden brown. Brush head, feet and tail with Sweet Bread Glaze (see recipe below) . 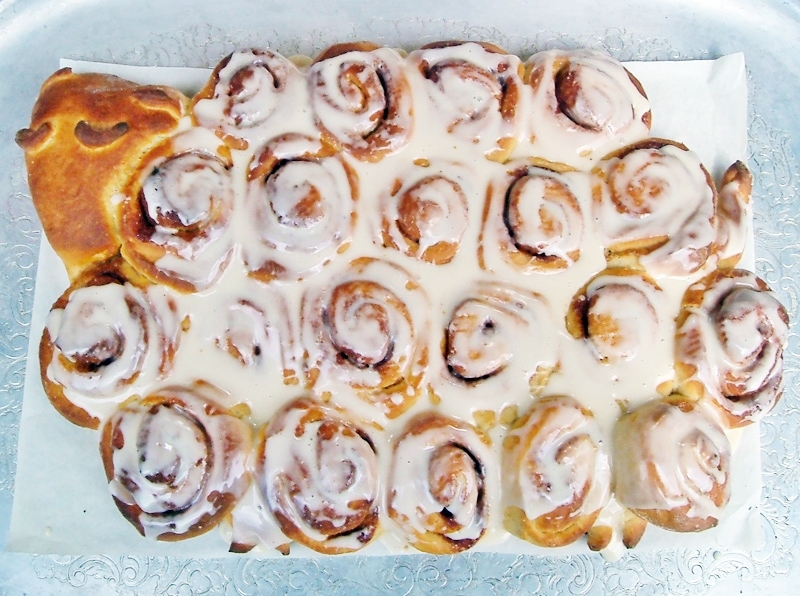 Spread the "body" with your favorite icing (powdered) sugar glaze, or Sugar Glaze or White Maple Glaze (recipes below), made with orange or almond extract. NOTE: If you want a richer dough, use only 3/4 c. mashed potatoes and add 1/4 c. softened vegan margarine (try my homemade palm-oil-free buttery spread). This is a great basic dough for breads that usually call for eggs and butter-- it's light and moist and just slightly sweet. I'll give you a few variations , but please experiment by adapting your own favorite sweet breads to this dough. 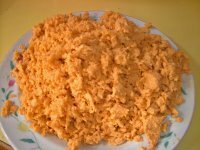 In a large mixing bowl or the bowl of a heavy-duty mixer, combine the milk and yeast. When the yeast has dissolved, add the mashed potatoes, wheat germ, syrup, sugar, lemon juice, salt, and turmeric. Mix in the unbleached flour. 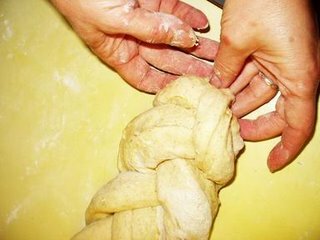 Knead well for 5 to 10 minutes (using as little flour as possible if kneading by hand-- the dough should be soft and a bit sticky). Place the dough in a greased bowl which will allow for doubling of the dough, turn it over to grease the top, and cover with plastic wrap, or place inside of a large plastic bag (to prevent the dough from drying out). 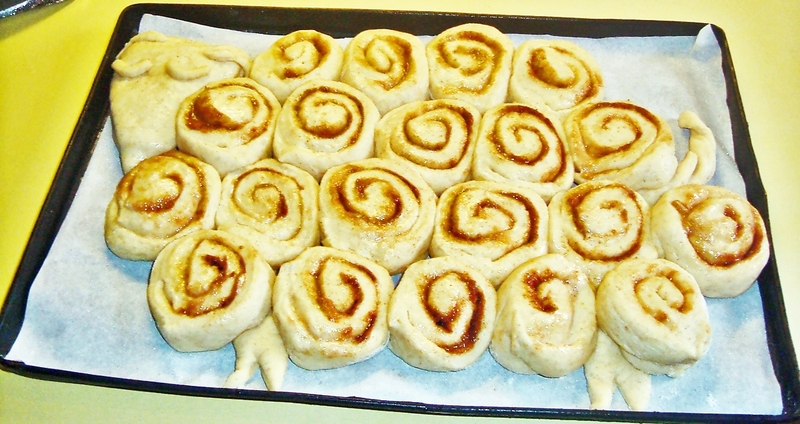 Rise overnight or for 8-12 hours in the refrigerator (this dough handles best when cold). 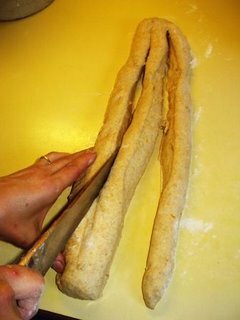 Several hours before serving, shape the dough into two loaves, or 16 large loaves, or 32 small rolls, according to the variation recipe you are using. Cover and let rise in a warm place until doubled. Bake at 350 degrees F for 20-45 minutes, depending upon the size and shape of the loaves or rolls. (Solid round or pan loaves may take as long as 45 minutes; long, braided, or ring loaves about 30 minutes; small rolls 20 minutes.) Cool on racks and decorate as directed in the variation recipe. BRYANNA’S WHITE MAPLE GLAZE Makes 1/2 c.
This can be used on sweet yeasted breads, tea breads, cupcakes, etc.. Mix the ingredients together thoroughly in a bowl. For a thin glaze, spread it on the hot bread or cake. For a firmer glaze, spread it on the cooled bread or cake. BRYANNA’S SOY-SUGAR GLAZE Makes about 1/2 c.
For a sweeter glaze that gets a bit crusty, try this easy one. If you use unbleached sugar, it's more beige than white. It's good on baked doughnuts or muffins baked in miniature bundt pans . 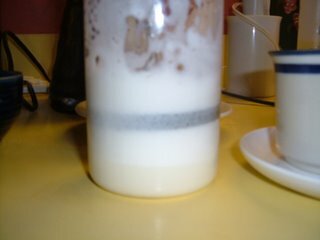 Melt the sugar and soymilk together in a small saucepan over medium heat, stirring, or MICROWAVE in a microwave-safe small bowl for 1 minute. 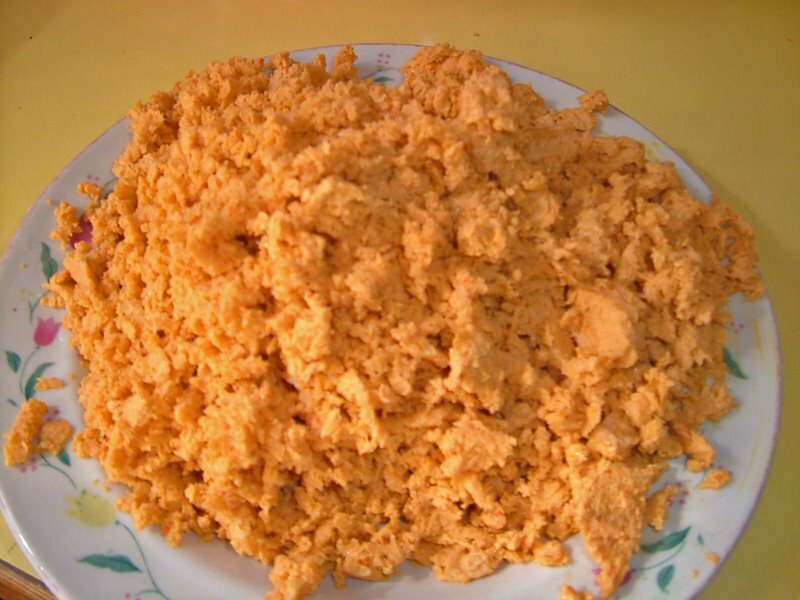 Beat in the soy protein powder and vanilla with a hand blender or electric mixer. Spread on hot cake, etc.. 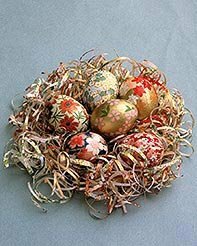 FLASH: There are some absolutely beautiful origami-paper-covered Easter eggs which look quite easy to make on p. 85 of the April 2004 issue of Martha Stewart Living magazine. The instructions are available online here. **Vegans can cover ceramic or wooden "eggs", available at crafts stores, instead of blown-out real eggs. ** UPDATE: Dye-able ceramic eggs, called Eggnots, are available here and here is the distributor in Canada. Paintable wooden eggs a readily available on Etsy.com. 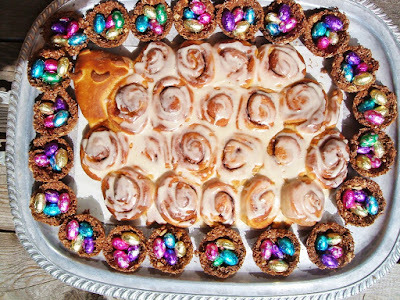 This is a picture from Martha Stewart Living-- I didn't make these, BTW. 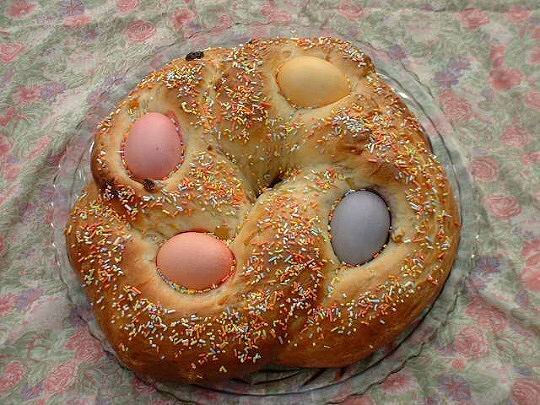 I have a thing about Easter breads. Easter doesn't seem like Easter without one. 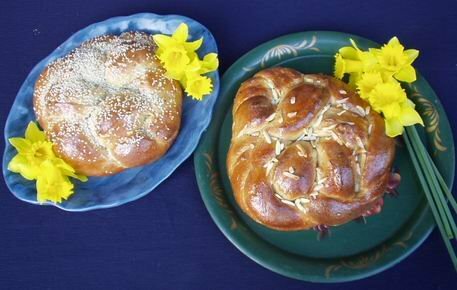 The yeast-risen breads are symbols of rebirth and the ring shapes of everlasting life. Eggs are also highly symbolic of rebirth. As vegans, we don't have to use real eggs-- we can use egg shapes in a symbolic way. 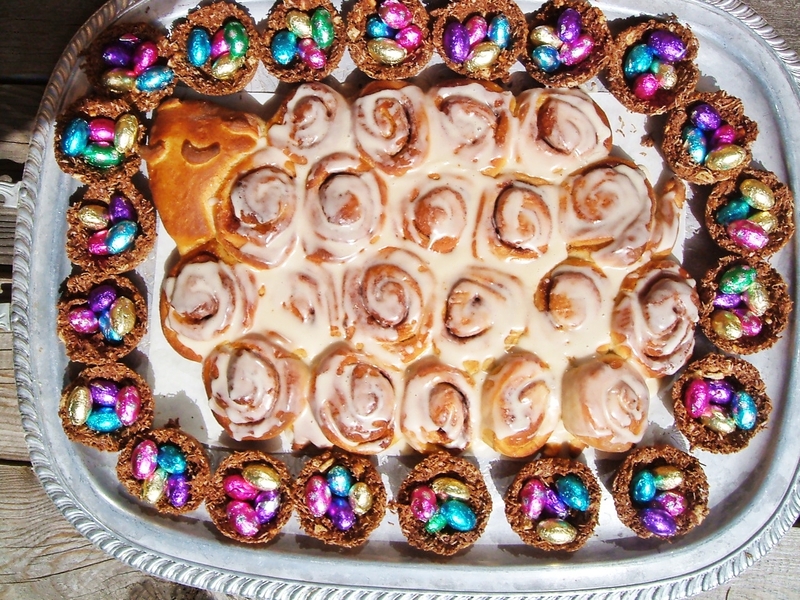 I used to make a special Italian Easter bread ring every year, because my father's Italian aunt, Tia Maria, made it every Easter in an outdoor oven in Lima, Peru. Of course, it contained eggs and butter, and was baked with raw, colored eggs nestled in the puffy dough (the eggs baked along with the bread). 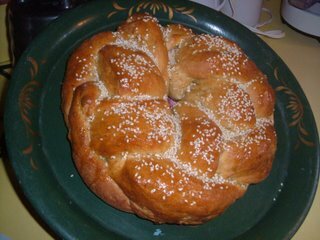 Because my father's maternal family came from the Genoa region of Italy, this Easter bread is flavored with orange flower water , fennel seeds (instead of the usual anise), pine nuts, saffron, and coriander, like the pandolce (pandöçe in Genoese dialect) made in that region. This bread is traditionally made with colored raw eggs baked right in the twists of sweet dough. To stay vegan, but keep the ancient Spring Equinox/Easter egg-as-symbol-of-new-life-and-renewal theme, you can mound candy eggs in colored paper "straw" in the center of the ring (dairy-free, naturally-sweetened, organic chocolate eggs are available in many health food stores at Easter, or from amazon.com in vegan milk chocolate or vegan dark chocolate), or use polished colored decorative stone eggs that are used for decoration or paperweights, or colored egg-shaped candles (after baking, of course). Here are some wooden eggs that could be painted and placed in the indentations of the twisted bread. Check out Vegan Lunch Box blog-- A Vegan Eggstravaganza-- for more ideas. Add the yeast and saffron to the warm water in a cup and let sit 5 or 10 minutes, until bubbly. 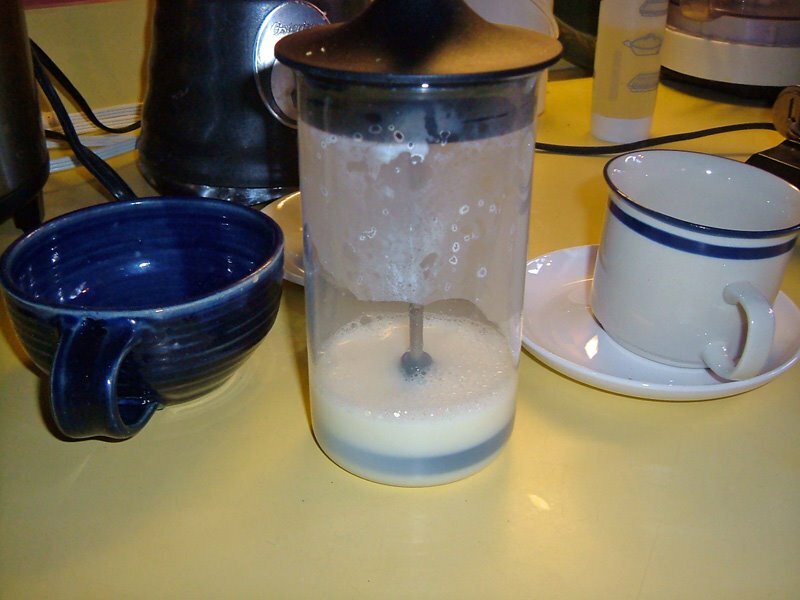 In a small saucepan or a microwave, heat the milk until it is just hot, with bubbles around the edges. Add the sugar and margarine and stir to dissolve. When the milk has cooled down a bit, add it to the yeast and water. Pour this into a large mixing bowl or the bowl of a heavy-duty mixer with a bread hook. Add the orange zest(white only), orange flower water, vanilla, salt, crushed fennel, and ground coriander to the bowl. Stir in the wheat germ and 1 cup of the flour. Beat well for a minute or two, then gradually add the remaining flour. Knead with a dough hook or by hand on a floured surface (adding as little flour as you can get away with-- oil your hands and the surface, if necessary) for 5-10 minutes. 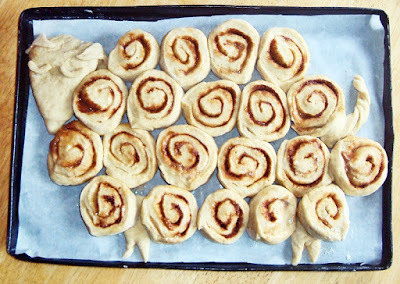 You can make this dough in a food processor, following the directions given with your machine. DO NOT add the dried fruit and nuts to the machine-- knead them in by hand after the first rising as instructed in the recipe. Process the dough ("knead") for 30-60 seconds. Place the ingredients in the bread container in the order instructed for your machine. DO NOT add the dried fruit and nuts at the beginning. If your machine has a sweet bread cycle, it will beep when it's time to add these ingredients. Otherwise, you'll have to pay attention and add them toward the very end of the kneading cycle, so that they don't get pulverized. Let the bread go through the rising cycle. Place the dough in a lightly-oiled bowl and turn it over to coat the top. Place the bowl in a large plastic bag or cover with a clean, damp tea towel and let rise in a warm place until doubled in size, 1 to 1 and 1/2 hours. 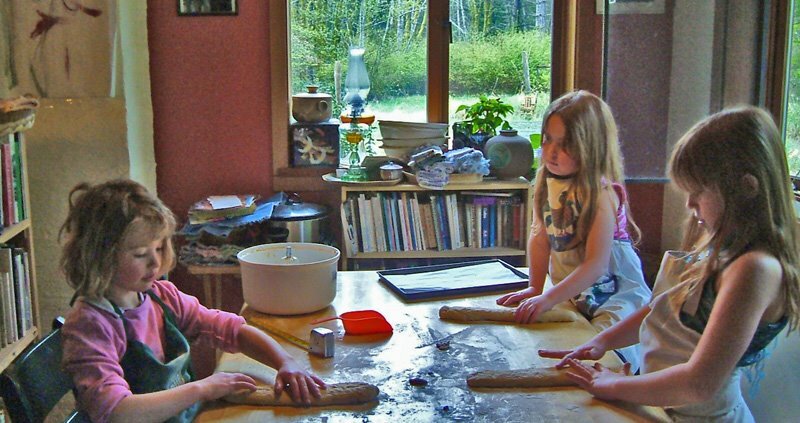 Turn the risen dough out on a lightly-floured surface and pat it out into a flat rectangle. Sprinkle the surface with the dried fruits and pine nuts. 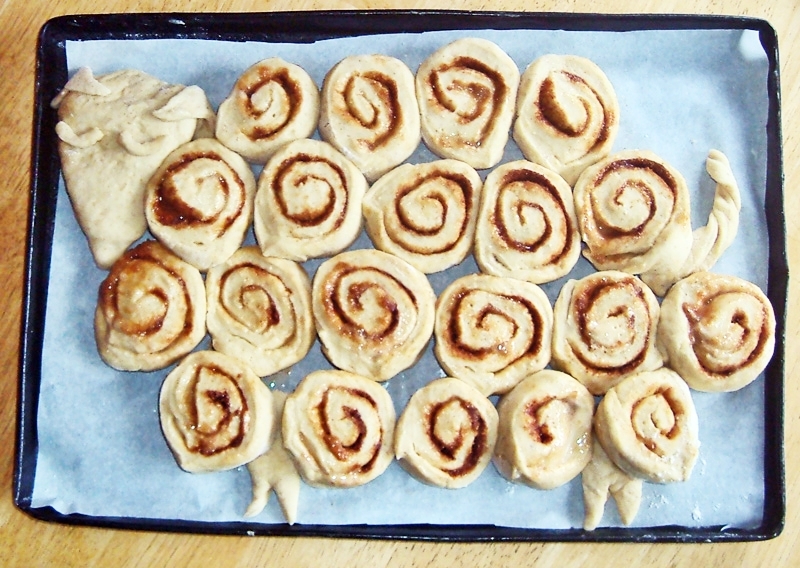 Roll up the dough jelly-roll style, then fold up the ends. 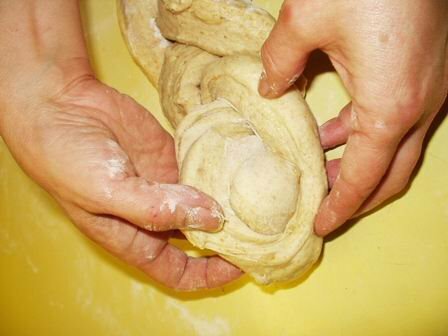 Knead the dough gently by folding and rolling until the fruit, etc., are well-distributed throughout the dough. Meanwhile, preheat the oven to 350 degrees F. Bake the loaves for 30 minutes in the center or upper half of the oven, or just until they are a deep golden brown and sounds hollow when tapped on the bottom. Place on a rack to cool. 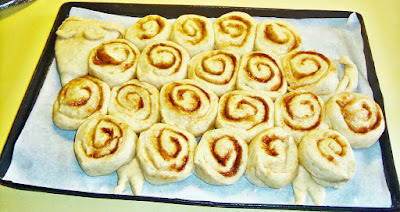 Spread either a powdered sugar glaze (organic powdered sugar is available), or the Protein-Sugar Glaze or White Maple Glaze (see recipes below) this on the bread while it's still warm and sprinkle the top with colored candy sprinkles, if you like. BRYANNA’S PROTEIN-SUGAR GLAZE Makes about 1/2 c.
Melt the sugar and milk together in a small saucepan over medium heat, stirring, or MICROWAVE in a microwave-safe small bowl for 1 minute. Beat in the protein powder and vanilla with a hand blender or electric mixer. Spread on hot cake, etc.. 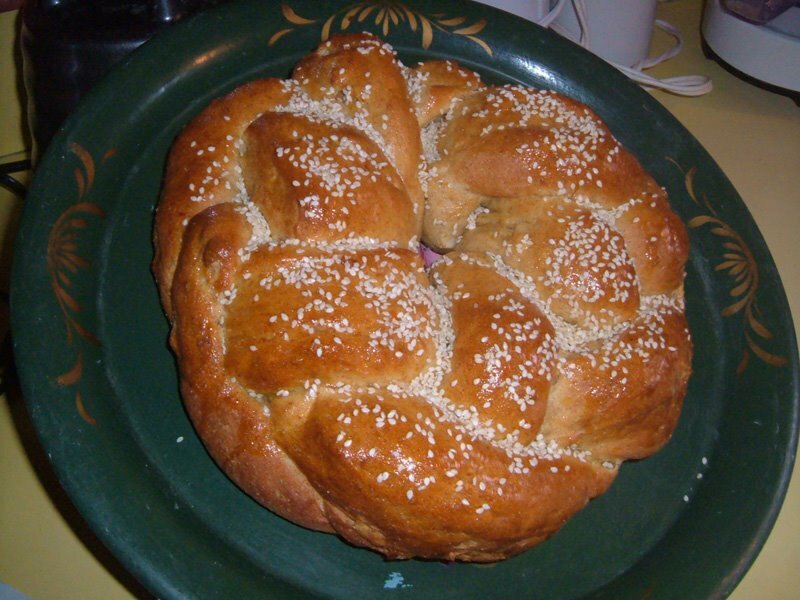 This lovely braided Easter bread is usually made with dyed red eggs baked into the indentations in the braid, but, for a vegan bread, you can surround the bread (after baking and cooling) with red egg-shaped candles or candies. (UPDATE: Now you can use red-dyed ceramic eggs baked into the bread. They are called Eggnots and there are links to info in the 1st paragraph of this post. )The eggs are an ancient religious symbol of fertility and rebirth, and red symbolizes Christ’s blood. Unfortunately, I didn’t have either at my disposal when I made my breads and took photos of them. 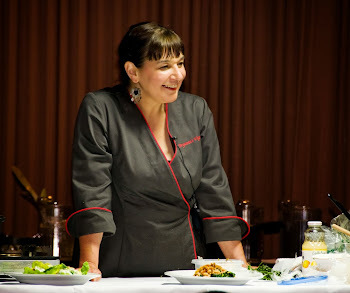 You can use the same dough as above and form it in the same way, but omit the orange zest, vanilla, fennel, coriander, dried fruit and pine nuts (you can use chopped almonds instead, if you wish), and, instead, use 1 tsp. of the Greek spice mahlepi described in the next paragraph, or use 3/4 tsp. ground anise seed. Instead of using a powdered sugar glaze (organic powdered sugar is available) or one of the glazes above, brush the cooled breads with this Sweet Glaze: Heat equal parts nondairy milk and maple syrup over medium heat. Do not boil or it may curdle. Brush over the breads to make a shiny glaze and sprinkle the loaves with lightly-toasted slivered almonds or sesame seeds.